Providing Quality Financial Services with Personalized Service. The Teachers Federal Credit Union was founded on April 8, 1937, in Room 122 of the Wichita Falls High School. Membership was open to the employees of the Wichita Falls Board of Education with an original cost of $5.25. Five dollars went to the member’s share account and twenty-five cents was to offset the credit union’s expenses. Early in 1949, the credit union officially changed its name to Wichita Falls Teachers Federal Credit Union. WFTFCU’s first permanent office opened on Jacksboro Highway 1972. In 1974, the credit union’s total assets exceeded $1,000,000. Spouses of WFTFCU members became eligible for membership a year later. 1979 brought WFTFCU another change of location from Jacksboro Highway to 2207 Brook Avenue. In 1979, WFTFCU opened the 3,000th member account and reached assets over $4,000,000. On October 1, 1980, the Wichita Valley Educators Credit Union of Iowa Park merged with WFTFCU, becoming the first expansion beyond the original field of membership. 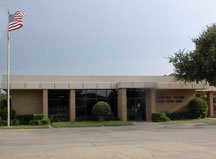 In 1981, WFTFCU began building its first complete facility designed specifically for a financial institution. Land was purchased next to Barwise Junior High School and architect Joe B. Roberts designed the 3,200 square foot building. The facility included a vault, loan offices, a drive-through teller window, lobby tellers and a member service area. Construction was completed on November 14, 1982. That same year, the credit union began offering Individual Retirement Accounts and total assets grew to over $6,000,000. 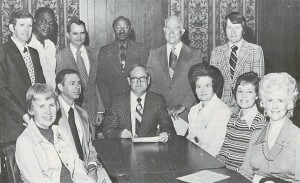 In 1983, WFTFCU opened the field of membership to other family members, a move that would spur the growth of the WFTFCU. Share Draft accounts were added in 1984 and membership requirements rose from $5.00 to $50.00 per account. The computer system was enhanced to provide online, real-time posting of member accounts. To accompany these new events at the credit union, a new logo was introduced, showing the “WFTFCU” initials supporting a bell tower of a school building. Although WFTFCU has since added other employment groups, the logo remains the same. In 2000, the Planning and Building Committees decided to hire the architectural firm of Bundy, Young, Sims and Potter to begin work drawing a new building. The plot of land for the new facility was named in honor of Lena Umbarger, the first Credit Union Manager. The grand opening of the new branch facility on Barnett Road was held on May 10, 2002. The 15,000 square foot building was equipped with eight drive through lanes, in-wall exterior ATM, lobby kiosk, 180 safe deposit boxes, board room, and a large, member friendly lobby. Throughout the years, WFTFCU has worked diligently to maintain the credit union philosophy of “People Helping People”.